Hold on tight to my hand today. You wouldn’t want to blow away. As a mother encourages her daughter to hold on tight on a blustery day, she inspires a wonderful flight of imagination as the girl thinks about all the wonderful thinks she could do if she was able to drift on the wind. Author/illustrator Sara Acton’s wonderful ink and watercolour illustrations give a wonderful sense of breezy freedom as the girl imagines riding on the leaves with her teddy, sharing tea parties in the tree tops with the birds, and practising tumbling tricks with a troop of ladybirds. Eventually, as the wind gathers dark rainclouds, the girl decides that maybe holding on tight to her mother’s hand today might be a good idea after all, although who knows what adventurous possibilities tomorrow might bring? 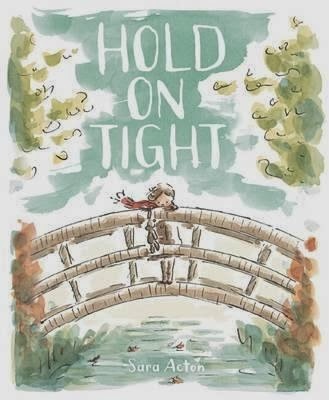 Beautifully illustrated with rhyming text, Hold on Tight is a lovely story about imagination and a reminder for parents of the wonder children find in the ever changing weather and seasons. It is also a touching reminder of the security children find in the encouragement and support of an adult as they explore their world.